MONTGOMERY, Ala. — Six wounded service members sponsored by Hope For The Warriors® have been invited by B.A.S.S. to participate in Toyota Trucks All-Star Week. 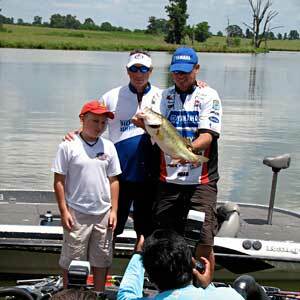 The wounded heroes will be paired with six Bassmaster Elite Series anglers to fish on a private lake near Montgomery, Ala., Saturday, July 30, 2011. Elite Series anglers participating are Keith Poche of Troy, Ala., Greg Vinson of Wetumpka, Ala., and four anglers eliminated from the All-Star competition. Anglers will be given four hours to fish, and final results will be revealed on the Bassmaster stage. “I look forward to getting the chance to spend some time with someone that’s given me what I have today, and has given me an opportunity to fish and live my dream. I’m very appreciative of them, and I’m thankful for who they are what they’ve done for this country,” Poche said. In addition to the special competition, the warriors will receive a gift bag provided by Bassmaster Elite Series sponsors, and each combat veteran will also receive a special tournament jersey from Gemini Custom Apparel. Hope For The Warriors® (www.hopeforthewarriors.org) is a national, nonprofit organization that supports wounded U.S. service members, their families, and families of the fallen. A group of military wives founded the organization in 2006. They stood together as they witnessed, firsthand, the effects of war on service members and their families. Since that time, Hope For The Warriors® has grown tremendously in the span of programs offered and the number of wounded and family members assisted. 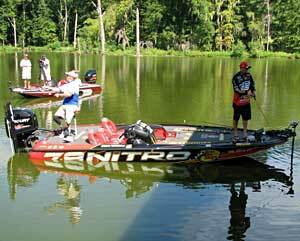 The 2011 Evan Williams Bourbon All-Star Championship is slated for July 29-31 on the Alabama River out of Montgomery, Ala. The All-Star championship will be the final event of the two-leg Elite postseason, in which the eight advancing finalists from the first leg, the Ramada All-Star Semi-Final in Wetumpka (July 23-24), will be seeded in a bracket-style head-to-head tournament. Winner takes all: $100,000. Daily launches will be at 7:30 a.m. (CT) from Montgomery Riverfront, and weigh-ins will begin at 5 p.m. (CT) at the Union Station train shed. For more information about the Hope For The Warriors® fishing event, and for a list of other events happening during Toyota Trucks All-Star Week, visit Bassmaster.com. 1. HM2 Dean Carr, USN, (Ret.) Jacksonville, N.C.
2. Cpl. Bobby Davis, USMC (Ret.) Mobile, Ala.
3. LCpl. Travis Johnson, USMC (Ret.) Greenup, Ky.
4. Sgt. Paul Walter, USA (Ret.) Selden, N.Y.
5. Cpl. Daniel Mullins, USMC          Gainesville, Fla.
6. CWO4 John Lightsey,USA             Atlanta, Ga.